Dr. John Karis graduated the medical school of Duke University and did his internship at University of North Carolina Hospitals. 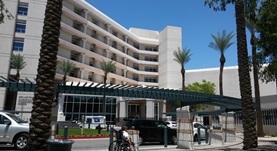 He completed his residency program at Duke University Hospital and his fellowship at Barrow Neurological Institute. Dr. Karis is specialized in Radiology and board certified in Diagnostic Radiology and Neuroradiology. He has been in practice for more than 20 years and is affiliated with St. Joseph's Hospital and Medical Center. During his career, he has also contributed to several publications of medical interest. Dr. John Karis has contributed to 3 publications. Sliding-slab three-dimensional TSE imaging with a spiral-In/Out readout. Li, Z.,Wang, D.,Robison, R. K.,Zwart, N. R.,Schär, M.,Karis, J. P.,Pipe, J. G.; Magn Reson Med. 2015 Mar 11. Arterial spin labeled perfusion imaging using three-dimensional turbo spin echo with a distributed spiral-in/out trajectory. Li, Z.,Schär, M.,Wang, D.,Zwart, N. R.,Madhuranthakam, A. J.,Karis, J. P.,Pipe, J. G.; Magn Reson Med. 2015 Mar 11.